Home: >Browse Listings >Authors >McNutt, Alexander G.
Alexander Gallatin McNutt was born in Rockbridge County, Virginia, in late 1801 or early 1802. He attended Washington College and studied law before moving to Mississippi, where he ultimately settled in Vicksburg. He conducted a lucrative law practice, during which he demonstrated a flair for politics and a knack for public oratory. After serving several terms in the state legislature, he was elected as Mississippi's eleventh governor in 1837 and re-elected two years later. In 1847, he ran for a seat in the United States Senate, but he was defeated by Henry S. Fote. 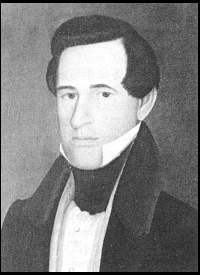 He died on October 22, 1848, in DeSoto County while on a political campaign. McNutt published his humorous sketches of sporting life in the wilderness from 1844 to 1847 in William Trotter Porter's Spirit of the Times. His tales, written under the pseudonym "The Turkey Runner," usually involve two characters, both of whom work for the "Captain" (McNutt) on a plantation in Mississippi. Though his tales today are recognized as no more than a representative of Southwestern Humor, during his day Porter recognized McNutt in his collection The Big Bear of Arkansas as a "formidable rival" of Thomas Bangs Thorpe, considered one of the pre-eminent authors of that genre. "Another Story of Jem and Chunkey." An Anthology of Mississippi Writers. Eds. Noel E. Polk and James R. Scafidel. Jackson: University Press of Mississippi, 1979. Howell, Elmo. "Governor Alexander G. McNutt of Mississippi: Humorist of the Old Southwest." Journal of Mississippi History 35 (February 1973): 153-66. Howell, Elmo. "Governor McNutt House." Mississippi Home-Places: Notes on Literature and History, by Elmo Howell. 1988. 244-45. This page has been accessed 3235 times. About this page counter. Last Revised on Monday, November 9, 2015, at 04:35:15 PM CST.